High heel shoes are everywhere. Women wear them to work and then wear them out for a night on the town. They do look good, but are they necessarily a healthy choice of footwear? Look at the position in which high heel shoes hold the feet. The toes are crunched up with all of the body’s weight on the balls of the feet. Wearing heels sparingly won’t cause any long-term damage besides some cranky feet, but imagine wearing them day after day. Your ankle range of motion will surely suffer from being in a constantly plantarflexed position. Guys can also fall victim of losing ankle range of motion from footwear. Obviously not from high heels per se, but any shoe with a higher heel than toe like dress shoes. These shoes place the feet in a similar position but a more mild version. But, why does all this matter? Ankle dorsiflexion is an important motion at the ankle. It is vital in our natural gait cycle to pull the foot up as we bring the leg forward in the swing phase. The lack of dorsiflexion can create a compensatory motion which alters our mechanics. And, as I have explained in previous posts, once we lack motion at one joint, we call upon other joints to go through a greater motion. This is evident in the basketball player who starts wearing ankle braces and then develops patella tendonitis. It’s difficult to tell women to stop wearing high heel shoes altogether, so there has to be some middle ground. Working on one’s ankle mobility is a way to help offset these negative changes brought on from these types of footwear. The heel elevated position tightens not only the joint itself, but the surrounding musculature including the calf (gastrocnemius and soleus). Therefore, we must take a joint and muscular approach when preserving ankle dorsiflexion. The active dorsiflexion range of motion at the ankle should be greater than 10 degrees. Anything less than this signifies a restricted ankle which increases the risk of compensation, decreases balance and proprioceptive information, and increases the risk of falls in the elderly. To address the muscular component and increase ankle dorsiflexion it is essential not only to stretch the muscles, but to address tissue quality. This can be done by foam rolling or seeking the help of a healthcare professional who treats soft-tissue. Below is the most basic example of foam rolling followed by how to properly stretch the calf muscles. Next, we can address the entire ankle complex by mobilizing the joint. Start with the first mobility drill and progress to the second with the band-assistance if needed. Incorporate these corrective strategies into your routine several times a day to see improvements in your ankle dorsiflexion. I’d always recommend making the appropriate changes to your footwear first, but if that is a stretch you can put some extra time in addressing the issues or preventing anymore loss in motion. 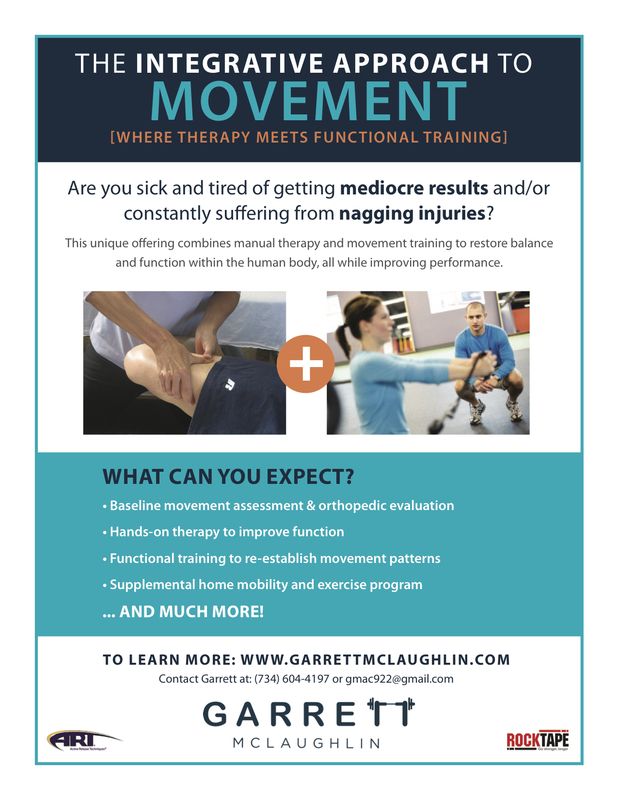 Garrett McLaughlin is an athletic trainer, personal trainer, and certified active release techniques provider. He enjoys incorporating soft-tissue manual therapy into his sessions to provide his clients the greatest avenue for success.